It is used in the metallurgical powder industry for the vacuum sintering of magnetic material. The raw material feeding process can help to oxidize the material. It provides a reliable guarantee for the production of high performance products. Detachable glove boxes can be connected to the user’s revolving vehicle. It can do horizontal and vertical motion. A removable glove box can be used with multiple vacuum sintering furnaces. 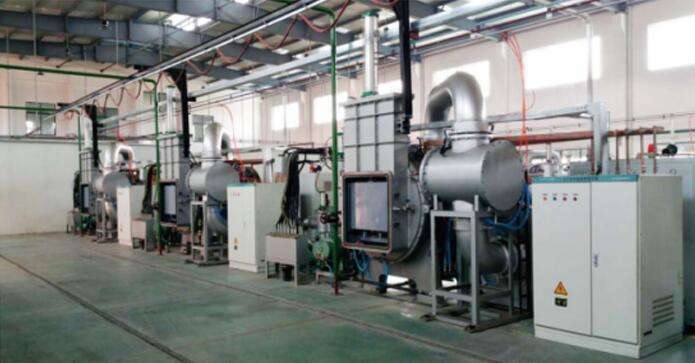 The two glove boxes share one track, which is two projects, small and cost saving, with two vacuum sintering furnaces. The control system is controlled by PLC and the intelligent thermostat controls the furnace temperature. Accurate control and high degree of automation. The furnace has a manual/automatic control system. The stove has the alarm function, the operation is simple.